Throughout this long Pittsburgh winter I’ve been working on a large-scale Array panel designed specifically for outdoor display. I create these panels by cutting up found plastic bags and tacking them together into intricate multi-colored mosaics. I’ve exhibited Array in a variety of interior spaces and found that the lighting of the panels is a crucial step in my transformation of this mundane and artificial material into an expression of beauty. I wanted to create an outdoor piece to further explore the impact of illumination and the environment. 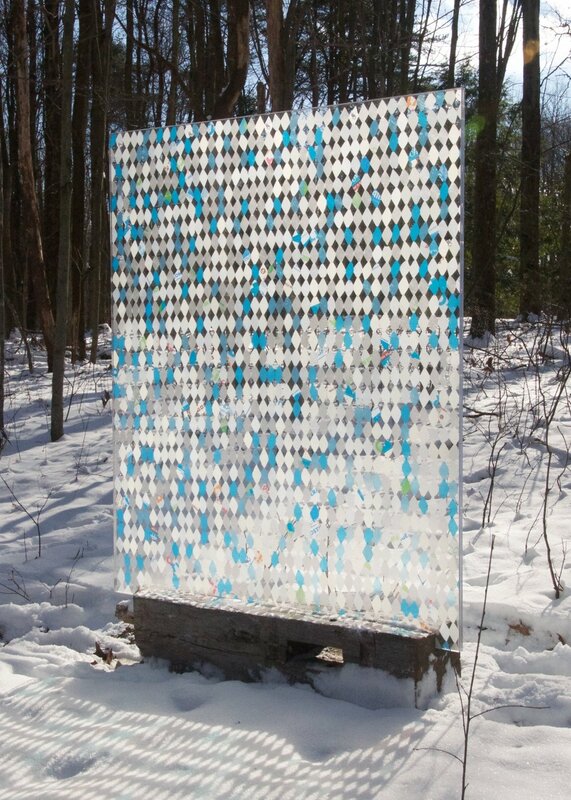 When I installed this piece in the woods surrounding my studio, I was struck by the way the natural light activated the color and plasticity of the bags while integrating the panel with its surroundings and allowing the scenery to become part of the image. This unification of natural and manmade expresses my belief that tension between opposites gives art its meaning and its depth.